A fresh video signed by Walko heightens the anticipation game ahead of the 2017 Mercedes GLC Coupe premiere, expected to take place sometimes this Spring – most likely at the Beijing motorshow. 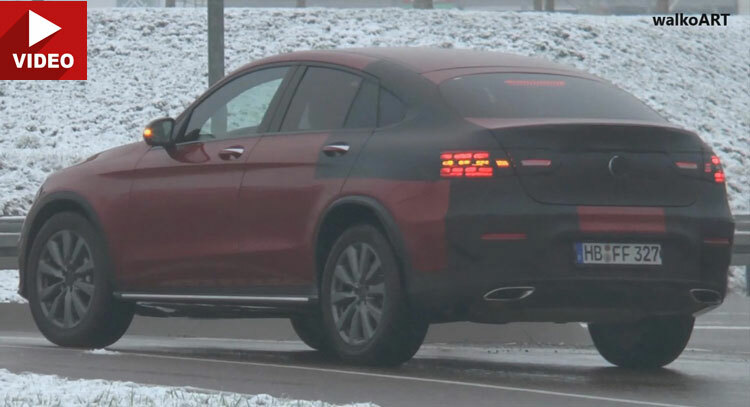 This is the smaller brother of the GLE Coupe and essentially the production version of the similarly called concept revealed at last year’s Shanghai motor show. As the debut closes in, the camouflage is running thinner and thinner, revealing the seductive lines of Mercedes’ new SUV coupe. The elongated roof flows seamlessly towards the beautifully sculptured back while the front end gives the first taste for the sporty, muscular philosophy that characterizes the whole car. Form follows function is a rule that doesn’t really apply to the GLC Coupe which places the main focus on design. Rear seat occupants might disagree with this philosophy, as head space will take a significant hit compared to the regular GLC. Tech-wise, the 2017 Mercedes GLC Coupe will inherit the MRA platform and its engine line-up from the regular GLC which translates to four and six cylinder diesel (2.1-liter 170 hp or 204 hp) and gasoline units (2.0-liter 184 and 211 hp). A plug-in hybrid version is also set to be available with a zero emissions range estimated at 30 km. We’re talking about the same powertrain used by the C-Class’ and GLC’s very own eco version: 2-liter turbo matted to a 60 kw electric engine.